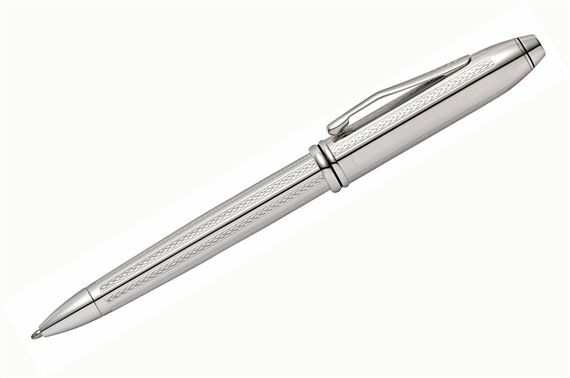 Order your Cross Townsend Platinum Plated Ballpoint Pen today from FahrneysPens.com. Fine Pens, Refills & Luxurious Gifts – great prices & fast shipping. With its distinctive wide-diameter silhouette, conical top and double- banded cap, the Townsend Ballpoint Pen is the jewel of the Cross collection. Now, Cross presents the Townsend in platinum, the most precious of metals, with an intricate diamond-pattern engraving. Polished platinum-plated appointments complete the look. The Platinum Townsend ball pen has a dependable, twist-action mechanism and carries Cross' lifetime mechanical guarantee.